The start of a new semester is always a busy time of year, but perhaps no other area of campus gets busy quite like the UNO Bookstore. 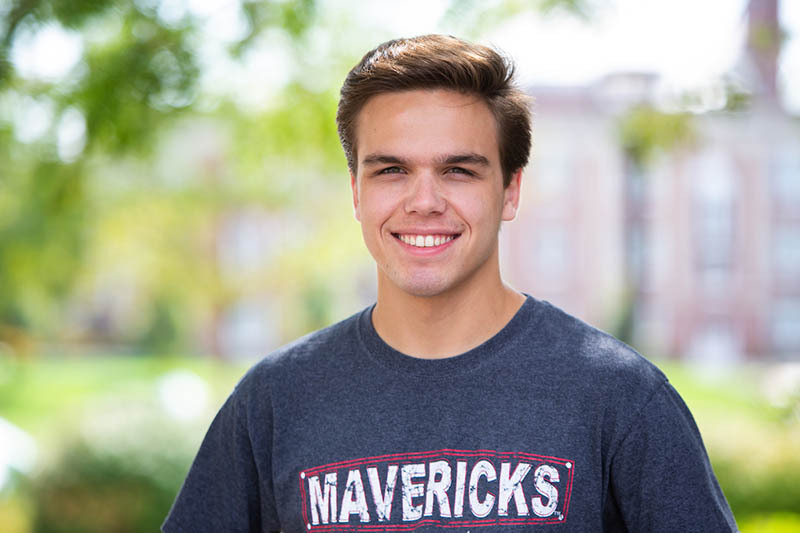 As new and returning students, and their parents, search for textbooks, notebooks and new Maverick gear, many of the staff helping things run smoothly are students themselves. Throughout the year, dozens of offices and departments, including the Bookstore, provide employment opportunities for students, from freshmen to post-docs. 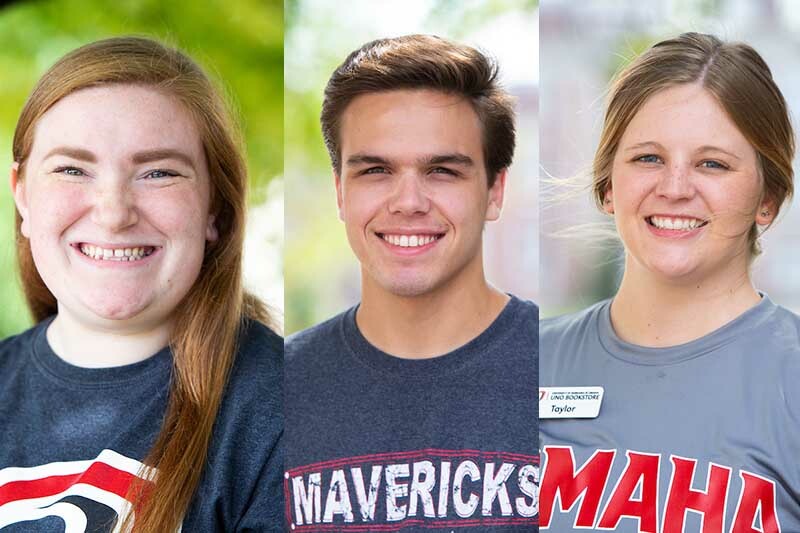 Here are just a few of the many student workers helping keep campus running – and gaining great experience at the same time. Abby Kane is originally from Minnesota, but has spent most of her life in Omaha. As a student at Millard South High School, Abby discovered her passion for political science and, following a visit to campus during “Be a Mav Day,” knew she wanted to come to UNO to help earn a degree that would help her pursue a career working in politics. Abby’s ambition also led her to also pursue a student worker position at the UNO Bookstore even before her first week as a student was over. 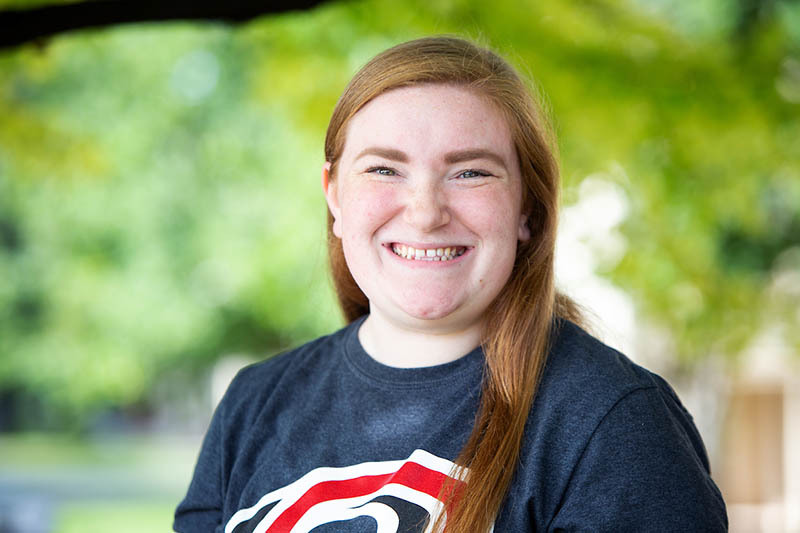 However, she says it has been the perfect fit given that she is now living on campus and has been engaged with UNO’s University Honors Program. When it comes to the back-to-school rush, Abby says take advantage of free shipping or in-store pick up through the online store. Born in Ohio but raised in Omaha, John Kramer has grown up around UNO, including spending summers at UNO’s Aim for the Stars camps. At UNO, John found a way to marry his love of music and his education through the Architectural Engineering program housed at the Peter Kiewit Institute on UNO’s Scott Campus. Pursuing a five-year master’s degree with a focus on acoustical engineering, John hopes to work as a consultant for engineering firms, including on projects like concert halls and music venues. After joining the staff of the UNO Bookstore a little over a year-and-a-half ago, Taylor Schulz has had the opportunity to be involved in pretty much every aspect of their operations. Whether it’s being behind the counter as a cashier, sorting through stacks of text books at the Bookstore’s warehouse, or helping design the main window display, it’s likely you’ve seen the results of her work in some form or another. A native of Wisner, Nebraska, being a student worker is not anything unique to Taylor. Prior to joining the Bookstore, she was a student worker for the Department of Gerontology and the UNO Child Care Center. Regardless of the job, she says working on campus is a great option for those looking for an employer who is willing to work with their class schedule. It is also an opportunity to make great connections. 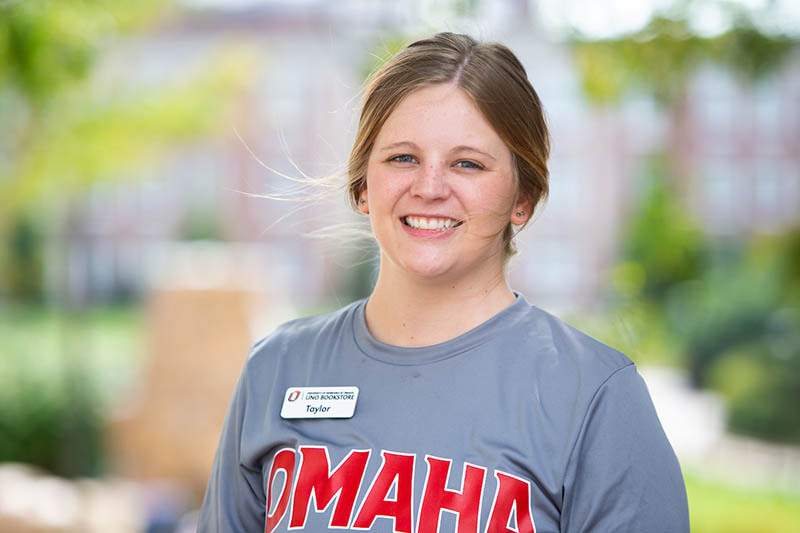 In addition to her work as a student worker, Taylor has also spent time as a member of her residence hall council, an assistant in UNO's anatomy lab and a member of the UNO National Student Speech Language Hearing Association. She is scheduled to graduate in May with a degree in Speech Language Pathology and hopes to continue her education with a master’s degree. In the meantime, Taylor is most concerned with making sure students are prepared to succeed in the fall semester.